I had tried fennel before, but had never personally made anything with it. 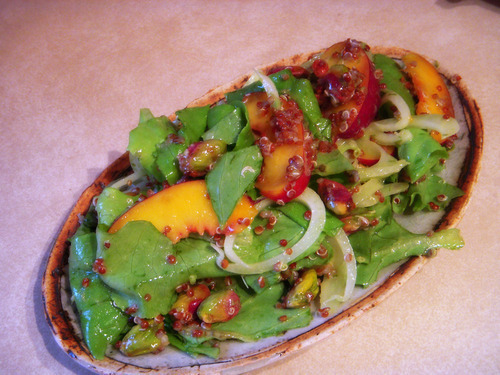 Once I saw Sprouted Kitchen’s recipe for a Nectarine & Fennel Salad though, I knew that had to change. For this recipe you’ll only need the bulb, but don’t discard the feathery tops, once separated from the stem, the delicate greens are delicious too. Add them to another salad or use them as a garnish on a chilled soup. 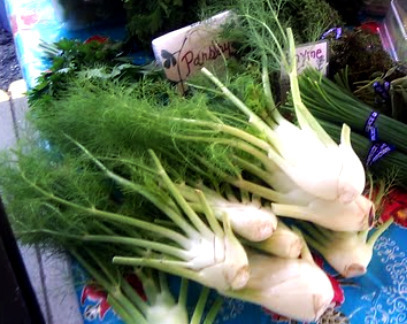 The image of the fennel seen above was captured this morning at the Ann Arbor Farmers Market. Remember to search on Real Time Farms to see where you can find fennel near you, because you’ll want to make this salad later this week! The salad combines greens, fennel, nectarines, pistachios, avocado, and red quinoa – and then it is all lightly dressed with a tangy mustard chive vinaigrette. It’s such a tasty combination, don’t be surprised when you find yourself going back for seconds and thirds! You should be able to find most of the ingredients at a farmers market near you, so plan out your shopping trip with Real Time Farms and get chopping! This entry was posted in In the Kitchen (recipes & more) and tagged avocado, fennel, lindsay jean hard, pistachios, quinoa, Real Time Farms. Bookmark the permalink.